Was searching something random online the other day and was shocked – shocked I tell you – to find my exact question had already been asked and answered. Has that happened to you yet? You turn to the Internet for answers to some question you believe to be unique and interesting, and your exact question pops up in the search box. My ego struggled with the knowledge that the wonder I’d been wondering, the ponder I’d been pondering, had already been both wondered and pondered. What if it’s already all out there? All the information, the questions, the answers, all out there on the Internet. Are we just recycling information and ideas? How long will it be before we all have access to all information? What’s the point? Why am I even writing? Made me think of that verse from the Old Testament. My Bible cheater notes claim that King Solomon, the author of Ecclesiastes, was merely describing the futility of seeking meaning in our own accomplishments. I began to test my “It’s already all out there” hypothesis, asking the Internet the most random questions I could dream up. Question: Do chickens get hiccups? Question: How do they get the membranes off mandarin oranges before they put them in cans? Question:What is the smelliest flower you can send someone? Answered. And you’ll need a BIG vase. Question:How many people in the U.S. are named …oh, I don’t know, how about Martin Pickle? Thank you, magical Interwebs (and this cool site). Apparently, there are four Martin Pickles in the U.S. I wonder what they’re like? I believe that’s where we find the reassuring answer to my existential concerns. Because who they are, those 4 Martin Pickles? No Internet can tell me that. Can’t tell me what their stories are, how their lives have been shaped. Can’t tell me what makes them laugh hard enough milk comes out their nose. Can’t explain why their families love them, or how they’ve been wounded, or what I could learn from any one of those Martin Pickles by knowing them. 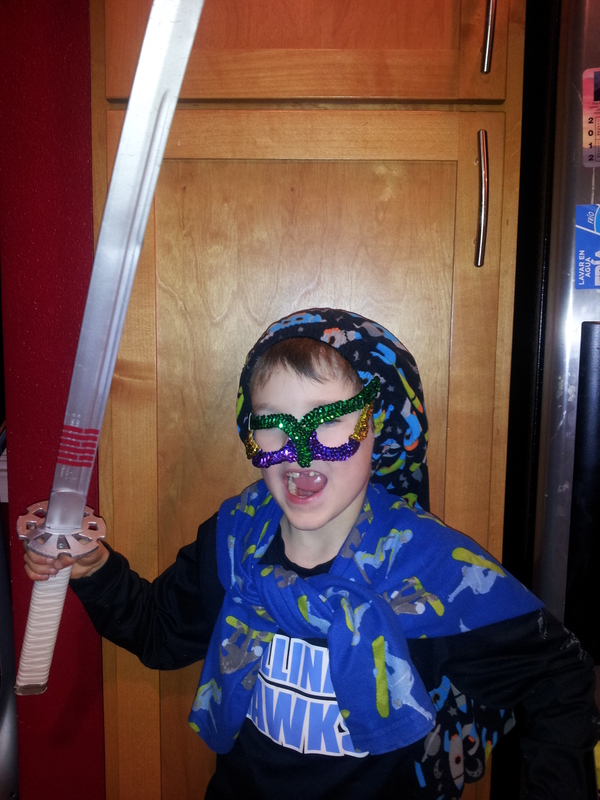 A whole special bundle of unique: Ya can’t go wrong with a Mardi Gras mask, a sword, and pj pants on your head! After all, we were formed by a Creator Who crafted us each one a unique facet of Himself, then lovingly placed us in a world so amazing that we’ll never be done learning all of the cool things He has in store for us. So…..enough existential ennui, we need to keep connecting and writing and creating. Because it’s in making the connections and revealing our facets to each other, that’s where the glory is! Posted in Uncategorized and tagged blogging, creativity, Inspiration. Bookmark the permalink.